Mr. Chancellor, Dr. Sanjaya Rajaram is an eminent plant scientist whose research and breakthroughs in wheat production and breeding technologies have benefited farmers, consumers, and hunger-stricken populations around the world. Born in 1943 in a small farming village in northern India, he attended school at a time when almost 96 per cent of the rural population had no formal education. After winning several undergraduate scholarships in India, he completed a doctorate in plant breeding at the University of Sydney. He then went to work at the International Maize and Wheat Improvement Centre in Mexico, under the directorship of Dr. Norman Borlaug, a 1970 Nobel Prize winner often called “the father of the Green Revolution.” After succeeding him as director in 1972, Dr. Rajaram continued to advance the Centre’s work during a period of intense scientific progress in wheat breeding and production. Most significantly, his research discovered ways to produce varieties of wheat better able to tolerate a wide range of climate conditions, provide disease resistance and permit growth in challenging conditions. His team subsequently developed 480 high-yielding, disease and stress-resistant wheat varieties that today are grown over 58 million hectares on small and large farms across six continents. The impact of these achievements cannot be overstated, as these varieties today provide the average annual wheat intake of as many as 2.5 billion people, the majority of whom reside in the developing world. In recognition of his work, Dr. Rajaram was awarded the 2014 World Food Prize, the foremost international award recognizing achievement in advancing human development through improvements in world food supply. Simply stated, his work is a truly compelling example of the potential and power of innovation in responding to the most pressing global challenges. 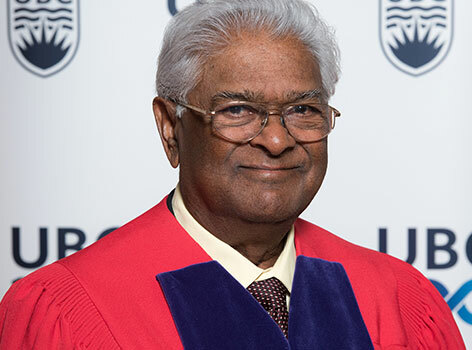 Mr. Chancellor, in recognition of extraordinary scientific and humanitarian achievement, I ask you to confer the degree Doctor of Science, honoris causa, upon Sanjaya Rajaram.